Posted by VU Managerial on Sunday, November 20, 2016 in News. The Managerial Studies Program debuted a new event series on November 4, 2016. This series will feature Vanderbilt and Managerial Studies alums that are 1-3 years in the professional world from a variety of industries. The idea is that students often get the chance to hear from people who are 10, 20, even 30 years into theirs careers, but they rarely get the chance to speak with alumni who are just starting their careers and have made that forthcoming transition from college to the “real-world.” This enables students to understand what companies are looking for in the interview process, what certain careers and industries look like, and how to deliver a strong performance on the job. The concept for this programming was developed by our administrator and Vanderbilt graduate, Michelle Olin. 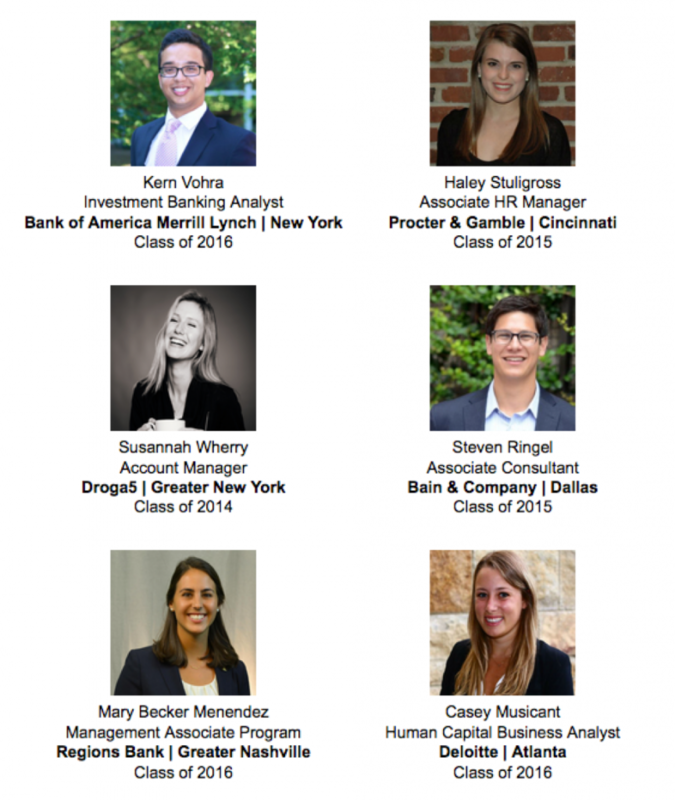 The advice these recent grads had for our students was exceptional. It was honest and enlightening. These panelists were able to connect with our students on multiple accords since they have taken the same classes, professors, and had the Vanderbilt Experience. Having two consultants provided an interesting banter about their differing experiences. Kern and Haley spoke about the importance of work life balance. Susannah, an Account Manager, offered strong insights into obtaining internships and employment in the marketing and advertising industries. Steven impressed upon the importance of putting in your “60” minutes a day to advance your career. Mary Becker talked about making connections with as many people as you can and asking about their professional experiences. Casey stressed the importance of networking and enlightened the crowd about the myriad of consulting opportunities. Following the panel was a brief catered reception, enabling the students to network with our alums and turn over résumés. The conversations were engaging and the Goo Goo Clusters were a crowd-pleaser! The two-hour event saw the mingling of guests; the students were able to form genuine connections with our alums. The discussions were personal and in depth. Interacting panelists shed light on the comparison of industries. Overall, the event was a great beginning to a new and valuable series for our students and we look forward to hosting more alums in the future!